The long and winding road of Big Joe Turner’s career continues with yet another record on yet another label, his fifth already in 1948. That’s hardly a promising sign for his prospects going forward. But of course this is no ordinary musical vagabond and while most of those records were stillborn commercially and flat-lined aesthetically as well, anybody with even the slightest awareness of rock history has to know that Turner will undergo a creative turnaround in the coming years the likes of which could hardly have been predicted by this point… well, unless you heard the last record we reviewed here this same month, I Don’t Dig It, which showed that he had it in him all along if only he was placed in the proper setting. I say “the last record we reviewed” because there’s not much hard evidence to go on which of these came out first. For starters, as mentioned, they were on different labels, as he was in the process of touring every company with an open door policy and a few crinkled bills to pass him for his troubles. But despite Turner’s looming historical legacy the fact is that most of those companies didn’t live long enough to see the mid-1950’s let alone beyond that, and thus saw whatever shoddy record keeping they might’ve been undertaking get tossed out with the garbage when they closed shop, means that verifying the release dates is an exercise in frustration. The usual aids in that endeavor – ads taken in trade magazines for instance – are of no help because companies like Down Beat barely had enough ready cash on hand to pay for a holly wreath to hang outside their door, let alone spend it on promoting a record in a magazine for the few distributors reading Billboard who might be moderately interested in those records. Since Down Beat was owned by Jack Lauderdale, who was a Los Angeles record distributor by trade, he didn’t NEED anyone else to take copies of it, as likely all he cared about was getting it into the local market he oversaw and hope it’d sell enough copies around town to pay for the fruitcake he sent his relatives that Christmas. So this might’ve come out a month ago for all we know. Chances are it didn’t come out AFTER Christmas however because the next numbered release on Down Beat (#153) was Turner’s Christmas Date Boogie and it’s doubtful that was issued in the New Year. Since his aforementioned record on Excelsior was followed on that label by Johnny Otis’s anticipatory Happy New Year Baby we also know with a fair amount of certainty that Turner’s record preceded it in the release queue. So that leaves us with this present for your Christmas stocking, a promising theme in Wine-O-Baby Boogie which while still in the colorful paper and bows will have you eager with anticipation… until you open it and promptly find that ol’ Saint Nick left you a nicely wrapped lump of coal. We should set the scene by saying that Down Beat was shaping up to be an interesting record label. Though they didn’t have many artists on their roster, they did have talented ones, starting with Lowell Fulson and soon to include Ray Charles making his recording debut. In other words they weren’t exactly issuing records pulled from the bottom of the barrel performed by musicians who had no business being paid money (that’s a joke, what indie label paid actual money to artists in the late 1940’s?) to cut records that nobody in their right mind would ever buy. Instead Lauderdale recruited established artists with good track records or highly promising newcomers and generally surrounded them with halfway decent musicians. So as one-off stops go Down Beat was at least an intriguing landing spot for Turner but the question naturally would be in which direction would they head stylistically? These sides were cut in late June 1948 and while rock music was almost a year old by then and had recently been making waves commercially it wasn’t a formidable or consistent force in the marketplace yet. Since Turner was adept at singing in all kinds of styles, from jazz to blues to classy torch songs and pounding boogies they certainly had plenty of options to choose from. For the most part it was a jazzy motif they stuck to, even the Christmas song fit in that milieu more than any other. Figuring into this decision no doubt were the musicians who were backing him in the studio. It’s an array of jazz schooled names that aren’t quite familiar, though not totally obscure either… with one notable exception on the positive side of the ledger that is, as longtime cohort Pete Johnson was anchoring the band on piano. This boded well for their chances of getting something memorable out of Joe of course, not to mention probably influenced their decision to venture into something more rocking on two of the eight sides, of which Wine-O-Baby Boogie showed the most promise. It stands to reason that if Turner was to pull out of the general downward spiral his recording career was now suffering from it’d be with someone like Johnson leading the charge, as his musical telepathy with Turner can be uncanny at times and whose keyboard work is never less than exhilarating when allowed to cut loose. Unfortunately they’re not alone on this session because the five man horn section (two trumpets, along with alto, tenor and baritone saxes) insist on making their presence known and the two entities pull at one another until the fabric tears down the middle and leaves Turner standing there in his birthday suit with a sheepish look on his face. I’m sure they all had high hopes going into this song because the idea behind Wine-O Baby Boogie is a durable one. An indignant Turner chastising his woman for getting on his case… about drinking, about money, probably about not doing the dishes and taking out the trash too. Big Joe for his part isn’t angry, he doesn’t lay down any threats or even sound at all perturbed by her pointing out his faults, but he’s not exactly taking her complaints too seriously no matter how legitimate they may be. 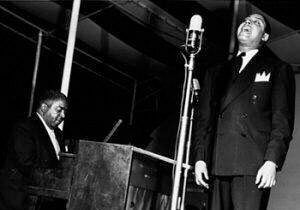 The song starts off like gangbusters with Johnson hammering away with his right hand on the keys. It’d help if he took his left hand out of his pocket to give this a deeper bottom from the start, but that’s a minor complaint at this point because his pacing and piston-like jabs make up for it. When the horns come in, trumpets unfortunately leading the way, they’re playing with suitable energy and emphasis and it would appear, the construction of their unit aside, that they’re all on the same page in terms of how to approach this. The rhythm section is buttressed by Addison Farmer’s steady bass and the solid, if discreet, drumming of Robert Brady but soon they’re forced to compete with the increasingly obstinate horns which take this further away from the groove that they kicked off with and threaten to drown the record in a shallow mud-puddle of yesterday’s ideals. The more the record goes on the more divergent their goals seem to be. While Johnson and company are trying to stick to basic drive the song calls for the horns are straying like sheep in an open field after the shepherd fell asleep. The saxes are headed down to the stream where they’ll follow it out of sight – a decent tenor solo rides the current in the best moment any of them have – but the trumpets have wandered into a pack of wolves it seems and are staggering about, jumping fences and falling all over each other in an effort to escape the danger and failing miserably at it. Nobody who’s been reading Spontaneous Lunacy from the start needs any reminder of how the trumpet sought to singlehandedly murder rock ‘n’ roll’s chances for a long healthy life. The instrument has been a unwelcome bane to far too many otherwise solid records, but THIS playing may very well be the most intrusive and objectionable we’ve encountered to date, especially considering the rest of the song’s strengths which those trumpets all but obscure the more their insipid atonal squawking is allowed to go on. Because of this the music is far more chaotic than effective and while everybody at least keeps up the tempo needed to keep this going forward, they have no sense of direction, or discretion for that matter, and consistently cross up one another along with frustrating the singer whom we’ve all presumably come here to listen to. Ahh, Joe Turner. You thought we forgot about him, didn’t you? Nope, we were saving Big Joe the indignity of having to be criticized for his role in this before we dressed down the horn players who got this song off track to begin with. But Turner’s not exactly an innocent victim in all of this. Whether he was distracted by the horns going off every which way under the sun or whether he just didn’t have a firm enough grip on the song to start with, his performance fluctuates wildly within, thereby ensuring this can’t ever fully overcome its weaknesses, despite moments of absolute brilliance that leave you stupefied that such extreme highs and lows came out of the same voice at the same session within the same song. In his best moments, which are all found in the record’s first half, Joe Turner shows that he’s in full possession of his powers. The lyrics contain some of the sharp biting commentary he’s known for, witty but to the point, bitingly descriptive but never over embellished. The first few lines flow so effortlessly and paint such colorful scenes that you’re almost ready to disregard the trumpets awkwardly inserting themselves in the proceedings as long as Joe can keep this up. He first trips himself up on the third stanza as he tries cramming the words twenty dollar bills into a passage that would’ve been much cleaner by dropping a syllable along the way. Why does it have to be twenty? Why not ten? Or why not merely say You must think dollar bills grow on trees rather than make the denomination specific? By not trimming it down it ruins the line’s scansion and he has to race to catch up with the accompanying music. If that were the only issue we might overlook it but unfortunately it only gets worse. Once he’s off the rails he never gets back on track as his next line tries to account for the added syllables and comes off as far too awkward and as a result Turner is clearly flustered. After a typically good piano solo from Johnson he either struggles to find his place in the lyrics (Turner couldn’t read so he always had to memorize the lines he wrote) or attempts to convince you that he’s talking to the girl in the studio rather than singing a composed song, almost as if he’s ad-libbing to her, and the song promptly breaks down, losing all of the melodic momentum it had been trying to build. The fairly strong sax solo that follows may get him out of the mud at least but by now he’s too far off course to find his way back to the road. He tries taking shortcuts and does himself no favors. He’s okay to start with, the horns even tighten up a bit (though that’s hardly saying much), but then Turner completely loses his way again and obviously forgets the lines that are supposed to cap the song off and he stumbles to the finish with a spoken aside that can’t help but make you cringe. The frustrating part of this is that strewn amongst the wreckage Wine-O-Baby Boogie had plenty here to work with. In fact with some re-tooling they could’ve easily built not just a good song, but arguably a great song out of if they just went back to the beginning and started over. The first step would be to club the trumpeters over the head with a lead pipe, truss them up and throw their unconscious bodies in the trunk, if not in the river. Even if you were forced to keep them on the session because they held incriminating evidence of the record company president’s affair with the cleaning lady they needed to be reined in by giving the trumpets less to do. Just a simpler and more rigid refrain to keep repeating rather than let them zig-zag all over the place would’ve tightened things up enough and allowed you to emphasize what worked – the piano and tenor sax – and let Turner carry the rest of load himself. It’s safe to say that even though Big Joe himself fumbled things going down the stretch that was hardly indicative of his skills and it’s hard not to think that most of Turner’s initial problems staying focused stemmed from getting distracted by hearing those ill-chosen horns stumbling around like three blind mice who’d taken a swim in a bottle of the wine that Joe was singing about. Oh well, there’s plenty of blame to go around. It was a double session that day with eight songs being cut, so who knows if they’d had any time to run-through the material beforehand or were afforded the opportunity for a second take on any of the songs. In the end though nobody won by skimping on time and effort. Down Beat didn’t get a hit out of a song that otherwise showed some really strong potential and Turner didn’t improve his standing enough to get a better deal when the next company came calling. His commercial losing streak was a hard enough pill to swallow, as he was now going on three years without a national hit to his credit, but that was shaping up to be a secondary concern to the more sobering thought that unless he got his head on straight, surrounded himself with musicians who were on the same page as he was and got signed to a long term deal on a record label with the patience to stay the course until it paid off, Big Joe Turner would be tossed out in the trash with the boxes, ribbons and bags that had been strewn about the living room on Christmas morning. 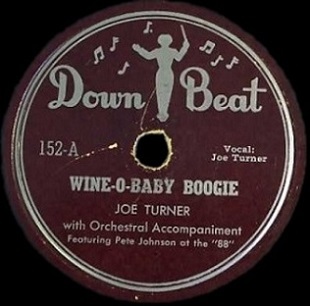 Leave a reply on "Big Joe Turner: “Wine-O-Baby Boogie”"